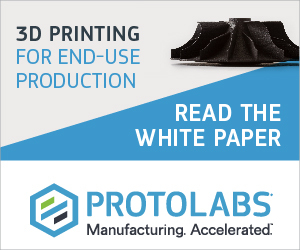 American automaker Ford Motor Company has revealed the use of 3D printing in generating the high performance of its new vehicle, the 2020 Mustang Shelby GT500. Virtual testing over 500 designs in supercomputers utilizing additive manufacturing prototyping tools, a team of Ford designers and engineers set out to make the “most advanced performance street-legal Mustang of all time”. 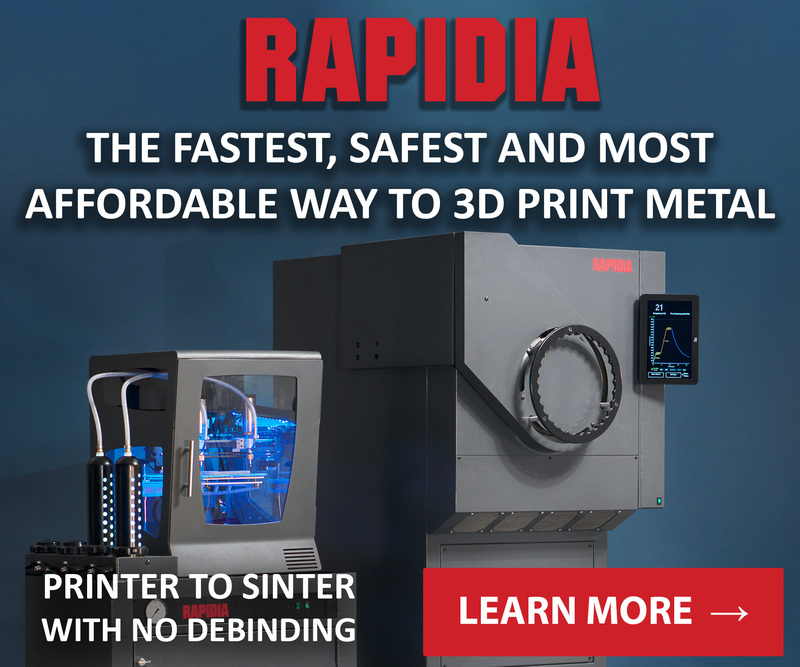 The 3D prototyping systems are located at its Advanced Manufacturing Center in Redford, Michigan, where the company also 3D printed the parts for the GT500. 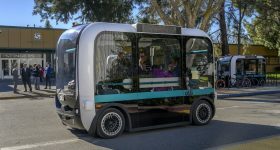 The vehicle will be released in fall 2019. “We created and studied designs among the engineering teams and proved out different strategies long before we built our first prototype cars,” explained Matt Titus, Ford Performance vehicle engineer. The 2020 Shelby Mustang GT500 was developed with virtual testing in supercomputers and 3D printing. Image via Ford. 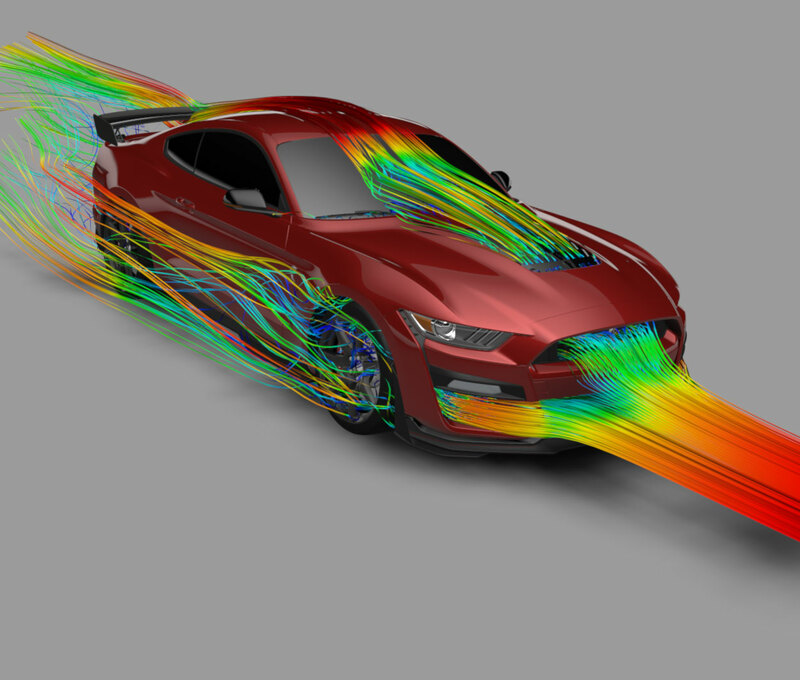 As well as its Advanced Manufacturing Center, the team at Ford also utilized the Ford Performance technical center in Concord, North Carolina to analyse designs for 3D cooling and aerodynamics in the Mustang Shelby GT500. 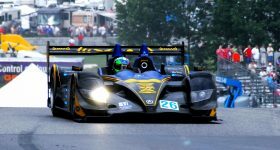 The vast number of designs allowed the team to reach its downforce, braking and cooling targets and maximize the aero performance of the vehicle. 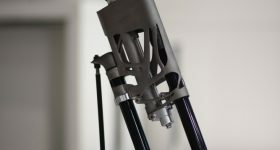 The designs with the most potential were 3D printed in a matter of days, speeding development time compared to traditional manufacturing processes. 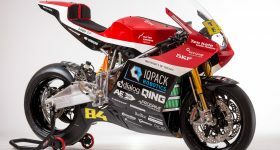 For example, the team 3D printed and tested over 10 designs for the front splitter wickers, and simultaneously tested them for track variation, increasing the efficiency of the design testing process. 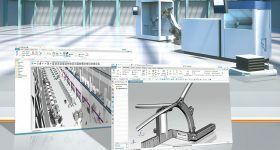 Physical validation of the designs were carried out in Ford’s wind tunnels in Michigan and Windshear rolling wind tunnel in Concord. Further tests for the GT500 were undertaken at the Virginia International Raceway, NOLA Motorsports Park and GingerMan Raceway to refine the aerodynamic designs and achieve record track times for a production Mustang. The exterior of the 2020 Mustang Shelby GT500. Photo via Ford. 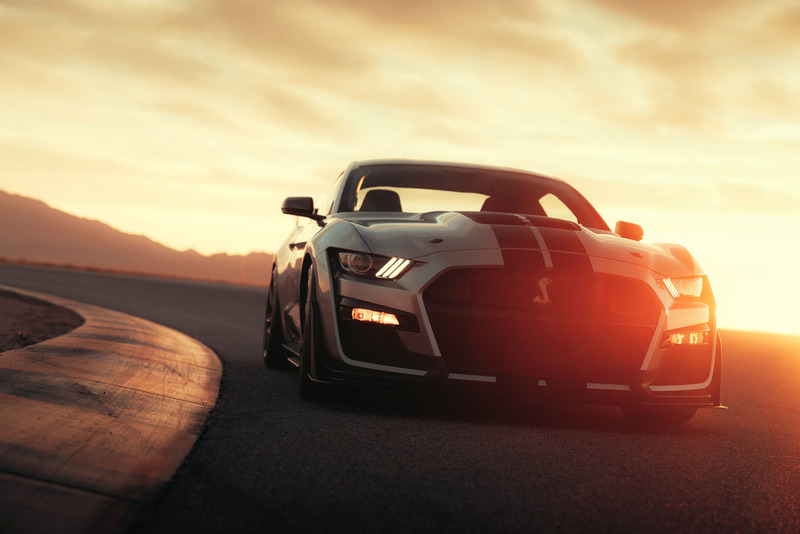 Key to the Mustang’s fast track performance was the refined front cooling system developed using 3D airflow modelling, allowing the GT500 to deliver over 700 horsepower using 93-octane fuel. 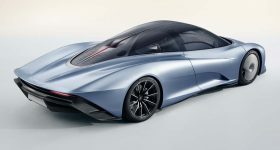 The team were able to maximize overall cooling to extract up to 230 kilowatts of heat energy that the car could produce at wide-open throttle, which is enough to heat 12 homes. 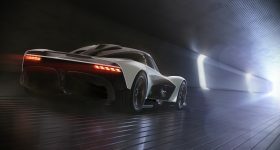 Furthermore, with the advanced simulations and prototyping process that utilized 3D printing, the team were able to manufacture a new rear spoiler design that works to deliver 379 pounds of rear downforce at 180 mph. 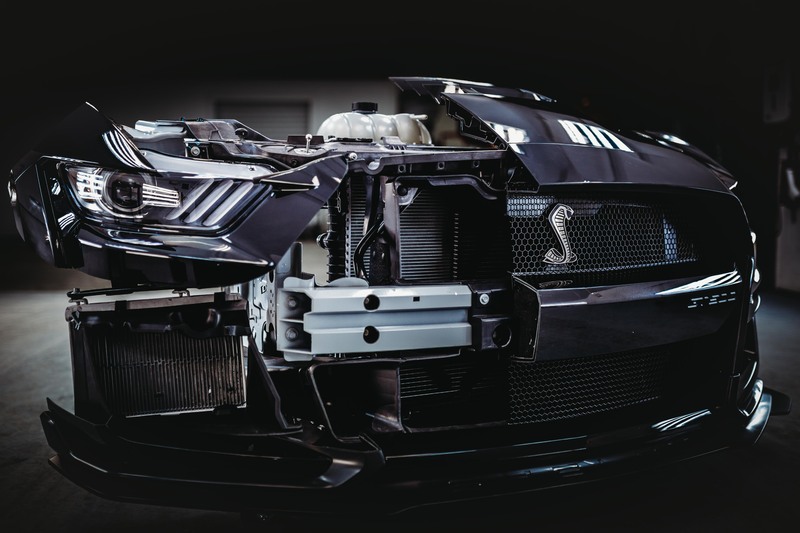 The front cooling of the 2020 Shelby GT500. Photo via Ford. 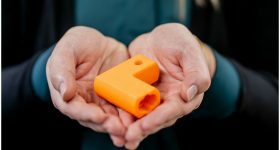 Since revealing the use of 3D printing at its Advanced Manufacturing Center for the new Mustang, the company has made further developments in 3D printing for the manufacturing of its vehicles. 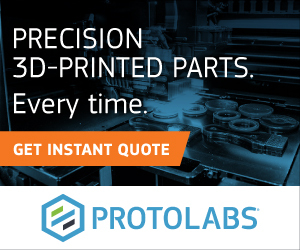 Ford has also collaborated with Carbon, the Silicon Valley-based company behind Digital Light Synthesis (DLS) 3D printing technology, to 3D print parts for vehicle production. 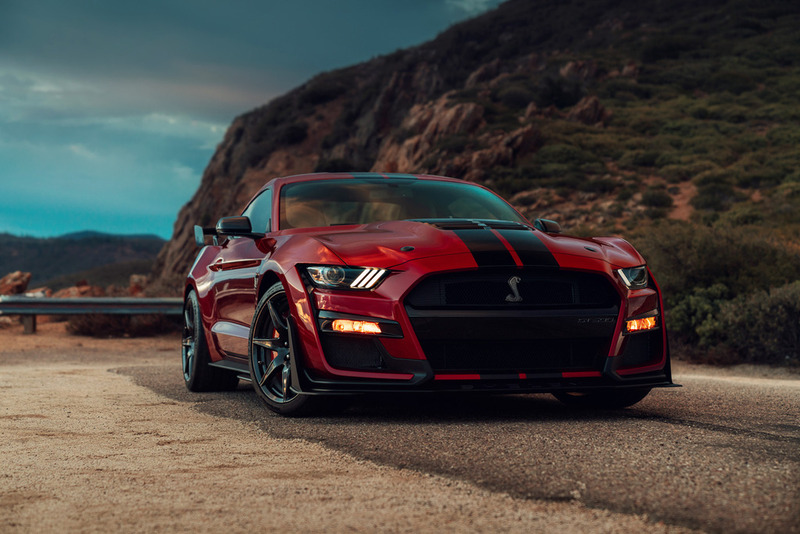 The companies debuted the parts at the North American International Auto Show (NAIAS) in Detroit, which included Electric Parking Brake Brackets for the Ford Mustang GT500. 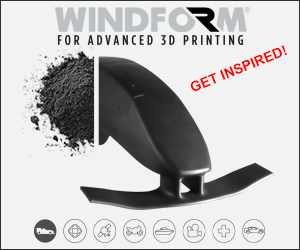 Furthermore, Ford Performance, a division of the motor company dedicated to high performance vehicles, has additively manufactured what its claims is “the largest 3D metal-printed part for a working vehicle in automotive history.” Developed at Ford’s German 3D printing lab on a Concept Laser X LINE 2000R from GE Additive, the aluminium manifold inlet part took five days to complete. The 2020 Mustang Shelby GT500 released in fall 2019. Photo via Ford. 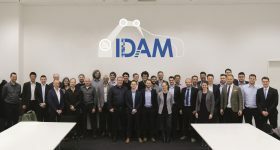 Cast your vote for the third annual 3D Printing Industry Awards and help decide this year’s winners now. Featured image shows top down view of three variant colors of the new Ford Mustang GT500. Photo via Ford.